Doesn’t Mother’s Day just scream “brunch” to you? And every brunch has to have a centerpiece. Something kind of special. Something memorable. Maybe Pancakes that are fit for a Queen – or a Mother. 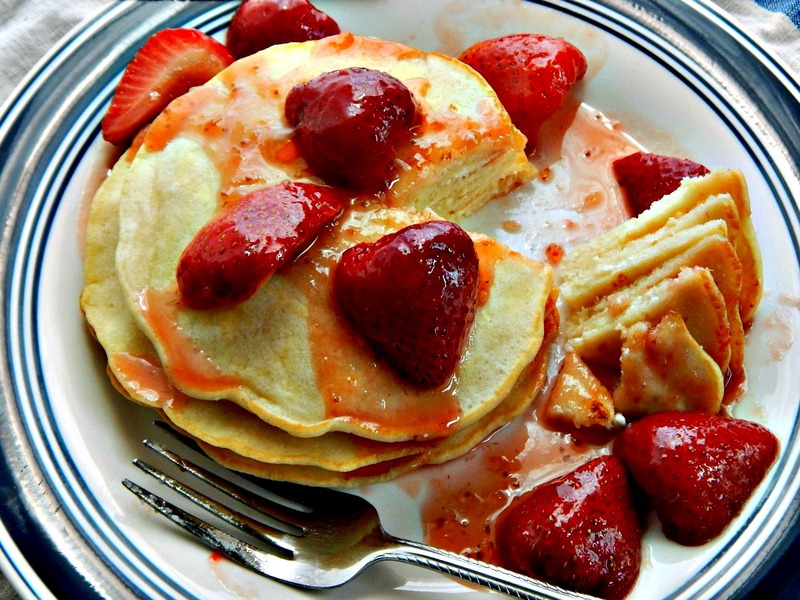 Something like Strawberry Cheesecake Pancakes. These Strawberry Cheesecake pancakes were a huge hit at our house. The were practically inhaled. The original recipe (from Good Housekeeping) said “serves 6” but between my Dad, my Stepmom and myself, we pretty much finished them off, they were that good. And then the couple that were left on the plate on the counter just slowly dwindled as people walked by and tore off a little corner or a piece here and there…and ate them bit by bit, cold, with no syrup whatsoever. The Strawberry Cheesecake Pancakes tasted like delicate crepes, and really had a very moist, crepe-like texture. The recipe was just a bit odd – there was no oil or butter and no fat at all except what was in the cream cheese, so they really didn’t “brown” hardly at all. Nor were they as light and fluffy as the photos on GH’s website. We didn’t care, though. We just kept right on eating, lol! I think an extra tablespoon or two of flour in the batter to make it just a bit thicker might have made them fluffier but I was quite happy just as they were, and I know the folks were! The only change I’d make would be to slice the strawberries just to make them easier to eat. Speaking of which, do serve these with the strawberries (or with some other berry or fruity syrup) to complement these pancakes. Maple syrup will overpower the cheesecake flavor. When I saw the amount of preserves here, I about had a heart attack! It’s a lot, and I did try to cut it back & ended up adding the full amount. Maybe if these were good, local sweet summer berries it would have been a different story. Do shop for things like jellies and preserves on sale with coupons and don’t forget to pick up cream cheese during holiday weeks. It’s almost always on sale. For other sale items to look for during the week preceding Mother’s day, check out my post on Mother’s Day Savings. In medium bowl, microwave preserves on high until melted, about a minute. Stir in strawberries; set aside. In another large bowl, with mixer on low speed, beat buttermilk, eggs, granulated sugar, vanilla and zest until combined. Add cream cheese in chunks; using clean hands makes this easy. Beat until cream cheese is well distributed but still slightly lumpy. Add cream cheese/buttermilk mixture to bowl with dry ingredients and gently stir until just combined (small lumps are OK). In 12-inch nonstick skillet, melt 1 tablespoon butter on medium. When pan is hot and foam from butter subsides, add batter by heaping quarter-cupfuls. Cook 2 to 3 minutes or until bubbles begin to appear and edges are set. Turn and cook another 2 minutes or until the pancakes are firm to the touch in the center. If desired, transfer cooked pancakes to baking sheet in 225°F oven to keep warm. Cook remaining batter in batches, adding more butter as needed. Serve pancakes topped with strawberry mixture and dusting of confectioners’ sugar. I’ll be bringing this recipe by Fiesta Friday # 177. I’m seeing lots of beautiful brunch dishes there for Mother’s Day! This entry was posted in Click here for Bargain Meals, Click here for Fabulous Food Posts and tagged Breakfast or Brunch Dish, Cream Cheese, Frugal Hausfrau, good housekeeping, pancakes, Strawberries, syrup. Bookmark the permalink. I love these! Everything about them is screaming my name! This looks and sounds like a pancake recipe I really have to try 😀 Looks so yummy! Thanks, Chef! Sorry to reply so late. These look really delicious. Wow. I know what you mean…I tend to avoid most pancakes. I almost feel sick after I eat them. Too much. These broke the rule for me! hawhawhawhaw….this is disgusting. Disgustingly good! 😀 hehehehe! Very interesting recipe. I never heard about similar. We do lot of quark pancakes, but recipe and technology is different. So thank you 🙂 I have to try this recipe ! We don’t really have quark, here, but substitute cream cheese, usually. The method was interesting because it left these tiny little lumps of cream cheese – you can actually see the cream cheese in the pancakes. Anyway I’d love to see yours! Thanks Rhonda! I hope you have a fabulous brunch. I think we’re doing the same.